Forget black tie: it's tie-dye dinner party time when Grateful Dead bassist Phil Lesh's San Rafael eatery opens in February. 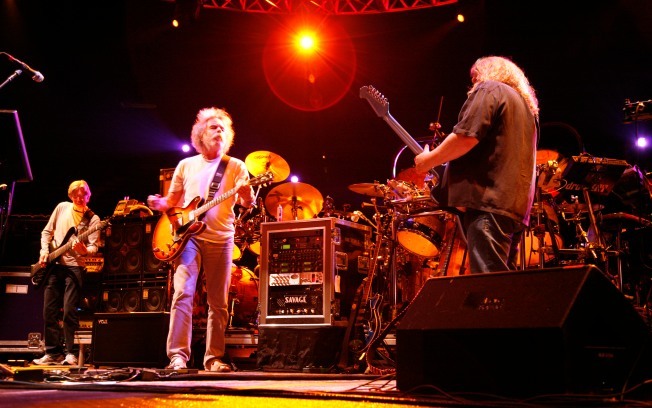 From left, Phil Lesh, Bob Weir and Warren Haynes of The Dead performing at the Izod Center on April 28, 2009 in East Rutherford, New Jersey. Lesh will perform in the culinary arts in San Rafael beginning next month. He's not trading in the bass guitar for a fork and spatula, but good cookin' will be in Grateful Dead founding member Phil Lesh's future just the same. The septuagenarian jam band man is opening up a restaurant in downtown San Rafael called Terrapin Crossroads, according to the Bay Citizen. The spot is in San Rafael's canal district, -- not far from a studio and hangout space used by the Dead from the 70s until Jerry Garcia's death in the 1990s -- and will offer performance space for music and poetry, and the expounding upon of all manner of theories, in an area called "The Grate Room." Grate Room -- get it? The first performances in the Grate Room will go on in March, according to Terrapin Crossroads's Web site. The first meals, featuring "organic, sustainable farm to table food" -- though Lesh is still on the hunt for a chef and the "scaled-down menu to start" will be built upon throughout the year. The dining room's scheduled to open in February. So if they've got a permit, I guess we're gonna go in.